The Metropolitan Opera premiere of Franco Alfano's Cyrano de Bergerac has been scheduled for the 2004-2005 season. 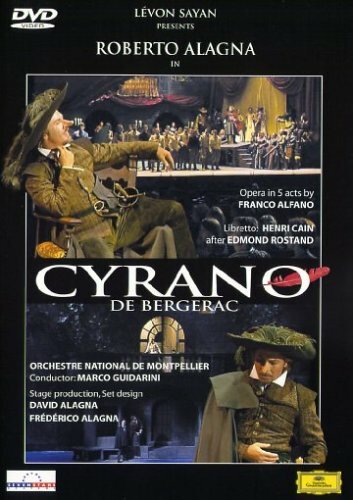 Plácido Domingo sang the title role in the Met premiere of "Cyrano de Bergerac" on May 13, 2005, with Sondra Radvanovsky as Roxane, Raymond Very as Christian, Anthony Michaels-Moore as de Guiche, Roberto de Candia as Ragueneau, and Marco Armiliato conducting. "Cyrano de Bergerac" is a co-production with the Royal Opera House, Covent Garden, and is directed by Francesca Zambello, with sets designed by Peter Davison, costumes designed by Anita Yavich, and lighting designed by Natasha Katz in her Met debut. The work was sung in French, the language of the opera's libretto, rather than the Italian translation used in the 1936 world premiere in Rome.